Synopsis (from Amazon): New Poetry Book Evokes Whitman and Emerson, With “Leonardo da Vinci” Insight. Born to generations of bookbinders, Irwin Jack Nissman was born into a love of books. He shares his talent for verse with all lovers of English, in his newly released collection, Preposthumous Poetry. The son and grandson of bookbinders, Irwin Jack Nissman was born into a love of books. At age 6, having read many volumes from the bookcase his mother had prepared for him, Irwin Jack Nissman's first creative inspiration was poetry. Brought up with a love of written and spoken words, Nissman would go on writing, as he had come to appreciate the power of his words to influence readers' thoughts and emotions. He had found his fellow humans to be remarkably receptive to poetry. 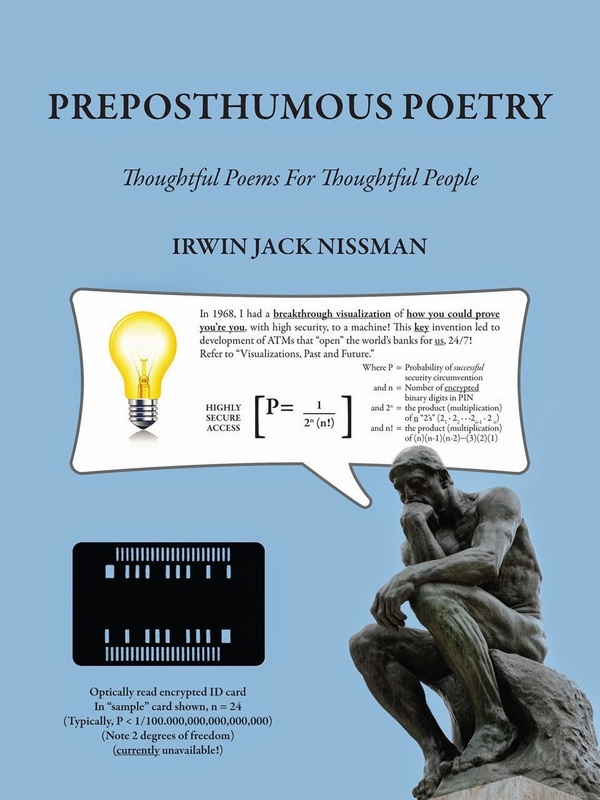 With Preposthumous Poetry, the author offers insightful and thought-provoking verses reminiscent of Walt Whitman, Ralph Waldo Emerson or Ogden Nash. Readers will be amazed by the range of topics covered in these tightly constructed rhyming poetic gems. Irwin Jack Nissman spent nearly 40 years as an electronics engineer, originating many computer-based systems. His secure ID card patent inspired other inventors to create bankcards and ATMs. In 1993, he reinvented himself, studying Computer Science, earning Network Certification and another M.S. (in Math Education). From age 66 to 75, he served as a grades 7-12 math, sciences and technology teacher in New York City, and taught home-bound students for many New York State school districts. In 2004, he returned to his first creative art form – poetry. It's been a really long time since we've featured poetry on the blog, so I thought it was overdue! This book came with several inserts containing extra information for me to read through including the author's Mission Statement and a few Summaries. Mr. Nissman has clearly lived a full life of experiences and makes that prevalent in his writing. Each poem is complimented with an explanation so the reader may be able to interpret the origins or inspiration for it. Although some of them are deep, the style of writing is very simple and easy to understand. They range from endearing to deep and Nissman even dabbles a bit into the absurd. What I didn't like, and find to be common among poets, is the overabundance of wordiness, commas, and italics. It is almost to the point of being distracting and is often added fluff. I can see how it may echo what's in their minds, but it wouldn't hurt to rephrase and omit some things to get their points across more efficiently and effectively.